Taylor Swift’s squad has Lorde, Ed Sheeran, and Emma Stone. 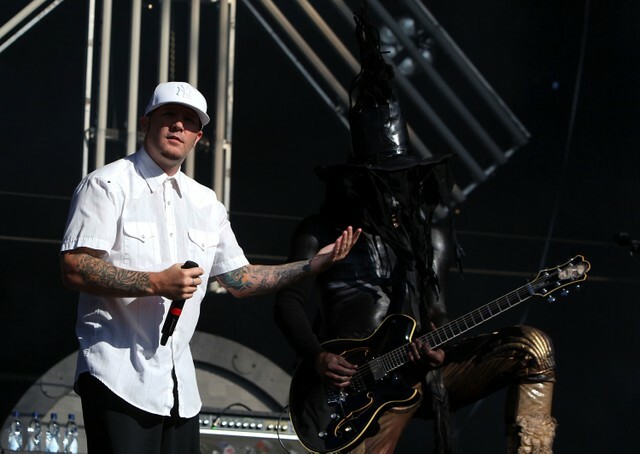 Limp Bizkit’s squad has Marilyn Manson, Billy Corgan, and Machine Gun Kelly. And during Limp Bizkit’s original lineup reunion show in Los Angeles last night, as Alternative Nation reports, all of those squad members were present. Rapper Machine Gun Kelly also showed up for “My Generation.” Limp Bizkit then covered George Michael’s “Faith” and played a medley of Green Day’s “Brain Stew,” Pantera’s “Mouth For War,” Journey’s “Don’t Stop Believin’,” and Metallica’s “For Whom The Bell Tolls.” Sounds like it was quite a show. I’m almost sorry I wasn’t there.